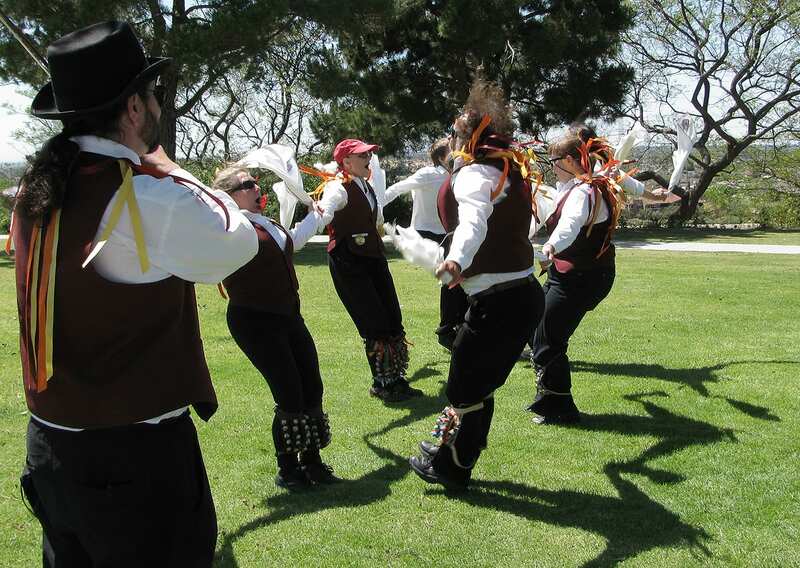 Rising Phoenix Morris Dance Group Returns to Ventura Harbor Village April 13th near the Carousel from 2:30pm to 3:30pm! What is Morris Dance you ask? The dances certainly are distinctive. Dancers wear bellpads on their shins, for a loud and rhythmic addition to the accompanying music, which is always performed live. Dances in the Cotswolds tradition will include handkerchiefs, long sticks, or short sticks. Some dances even feature the sticks being tossed from dancer to dancer! Outfits (called kits) vary by region, but are often either all white with sashes across the chest or more colorful garb decorated with ribbons, which are meant to imitate rags. Morris sides performing Border Morris, associated with the region near the English/Welsh border, used to perform in blackface but today often wear colorful face paint. Some traditions will feature a fool, who is not dressed like the others and who drives audience interactions. Except for Molly dancing in the Midlands and East Anglia, which is performed towards New Year’s Day, Morris dancing has been a springtime event since Shakespeare’s day and is danced primarily at Whitsunday and May Day. As English expatriates settled around the world, they brought the custom with them, and today the tradition is worldwide, with hundreds of sides (dance groups) in existence.